Life Skills 101 is a program that teaches youth critical life skills through edutainment. All of our programs are highly interractive keeping the youth engaged and motivated. Each module is quality content-rich, while designed to be entertaining, allowing the youth to learn important life skills in a non-threatening, friendly, and fun environment. Our students were exposed to a valuable topic that would enhance their self-confidence when communicating or making choices in their career path. They became aware of different behavioral and communication styles and learned how to communicate with each style most effectively. - Turn Your Scars into Stars - How to Come Out Victorious After Facing Serious Crisis? 4. Awaken the Leader Within! - Finding Your Voice - What is Your Leadership Style? - Are Leaders Born or Made? - College, Trade School, or a Life-Time of Low-Paying Jobs? - How to Find Your Dream Job? - They Do it, Why Shouldn't I? - It's OK to be the Only One Standing..
module can be presented as a stand-alone workshop. I learned that it is ok to change and be different from others. It is ok to be "balanced" - you don't always have to choose a side - sometimes you can remain in the middle. I enjoyed the speakers and the way thay they presented. Today I learned how to interract with people of different personality styles. I also enjoyed very much E.G. Sebastian's humor. I loved it when they used humor to make us understand more... I recomend this presentation to others. It is fun an dexciting. They should attend because they will learn a lot. I enjoyed most the part where the presenters told us about their life . To me it meant that you don't have to be perfect to [successfully] pursue your dreams. Today I learned to talk to the four personality styles. I recomend others to attend this workshop because they could learn more about themselves and others, and to show that everyone is different. The world needs different people. The things that I can apply imediately in my life are learning how to be more confidentd and outgoing. I enjoyed most the magic knot "thing." I recomend this presentation to others - it help you get to learn more about yourself. After this workshop I can definitely take my education seriouslly. I recomend this workshop to others - it can definitely teach you thinngs you woul never even think of learning. I enjoyed the interactive activities and learned a lot about my behavioral style. I would tell others to attend this workshop to learn about their strengths and weaknesses, and to learn more about their communication style. I learned about different personality styles and how to approach different people. I enjoyed the entire presentation and the way Mr. E.G. and Ms. Tiffany presented! It was all good! I learned how to set goals and try and reach them. Your presentation made me realize that basically the future is what you make it. The most valuable information I learned today was to Treat People as They Want to Be Treated. The presentation was "different" and energizing. I enjoyed the interaction among the groups. I think the workshop was very informative and is very much needed in today's society. We need to learn how to deal with people who are different from us. I learned how to approach and interract with people of different personality styles. I would encourage others to attend the "Effective Communication Skills" module to improve their people skills. 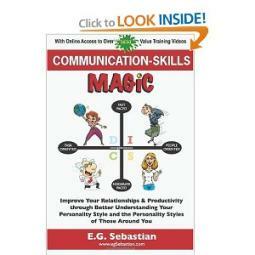 This workshop [Effective Communication Skills] is very entertaining and you will learn about yourself. I highly recomend this workshop to others. You'd learn a lot about how to communicate with [people of] different styles. They shoul dattend because it would motivate and help you in life!